Eternal Youth Preservation Serum, value $75!!! We’ve teamed up with My Subscription Addiction founder Liz Cadman to curate these two choices from one of her favorite brands. This lightweight serum boasts some of Mother Nature’s most effective gifts — Blue Seakale and protein-rich sea algae, to soothe, revitalize and deeply moisturize for improved skin tonicity and firmness. At the heart of this amazing elixir — Barbary Fig Plant Stem Cells and D’Orientine S, a botanical active extracted from date seeds, display strong youth preservation properties and help to reduce the appearance of fine lines and wrinkles. Cruelty-Free, Vegan, Nontoxic, Made in the USA. The April/May Box supports Farm Sanctuary, whose mission is to protect farm animals from cruelty, inspire change in the way society views and treats farm animals, and promote compassionate vegan living. Guilt-free, cruelty-free shopping! 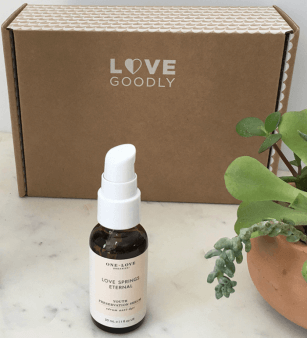 Love Goodly supplies a box of stylish, eco-friendly and healthy beauty, fashion and wellness products. Discover products that are stylish, natural and eco-friendly. And every purchase supports a cause.